I’ve always been semi-aware of the benefits of Vitamin C when it comes repairing, strengthening, firming, and protecting skin (through a huge boost of antioxidants!). But it wasn’t until I tried Peter Thomas Roth’s new Potent-C Vitamin C serum, and witnessed the serum’s overnight effects (I’m talking super glowy, smooth skin the next morning! ), that I decided to give it a permanent spot in my skincare routine. Farmacy’s Bright On Vitamin C Mask is a skin-perfecting multi-tasker. It joins a detoxifying clay mask with a clarifying Vitamin C serum to help conquer a range of skin issues – all in one treatment. And while that may sound like a horrifying combo for sensitive or very dry skin, Farmacy’s formula is designed to be extremely gentle, soothing, and non-drying, making it suitable for all skin types. Fruit-derived AHAs (including Bilberry, Sugarcane, Orange, Lemon, Sugar Maple). These work as chemical exfoliators and help resurface skin, creating a smoother, more even texture. Loads of antioxidants from natural fruit extracts help protect and repair skin. Mineral-rich (as well as food grade!) kaolin and bentonite clay draw out impurities, clarify, and minimize the look of pores. Aloe, gylercin, and a special blend of superfoods (including Apple, Broccoli, Kale, Blueberry and Cucumber) help cool, soothe and moisturize. Natural plant oils help nourish and hydrate. Apply a generous amount to clean skin, massaging in circular motions until color transformation has occurred. (You may have to add a few drops of water to your skin during this process to get the formula to spread more evenly and change color). Avoid your eye area. Leave the mask on for 5–10 minutes, depending on how sensitive your skin is. Finally, rinse with water to remove and reveal smoother skin! Use up to 2–3 times per week – or less frequently if you have very dry or very sensitive skin. Also, because this mask contains AHA’s, it makes your skin more vulnerable to sun damage, so make sure to apply sunscreen and limit sun exposure afterwards. I started my trial of the Farmacy Bright On mask at a time when my skin was looking a bit rough and uneven. I hadn’t been keeping up with my usual exfoliation routine, so dry patches and large pores were among my top issues. I used Farmacy’s Bright On the recommended 2-3 times for a full week and was amazed at my results. But before we get into that, let’s take about how Bright On works! When you first squeeze the formula out of the tube, you’ll notice that it comes out as a pale lavender. It also feels quite thick and clay-like, though on the plus side, it manages to glide over the skin effortlessly while feeling cooling and refreshing at the same. Since Farmacy’s Bright On mask is massage-activated, the next step once you’ve applied it all over the face is to gently massage it in. This action breaks the micro-sized Vitamin C pods and releases it into the skin. To signal that this process is happening, the mask will gradually turn from its original pale lavender color to a cool pale mint green. Once it’s completely transformed into the green color, it’s time to let the mask sit and work all that Vitamin C plus other natural goodness into the skin! Over the course of the next 5-10 minutes or so, the mask’s clay ingredients (including kaolin and bentonite) will cause it to gradually dry down. But dry skin suffers need not worry! Moisturizing ingredients like aloe, glycerin, a special blend of superfoods, and a whole slew of natural seed oils help to counteract the drying effects of these clays, leaving the skin feeling balanced rather than tight or dry. These soothing ingredients also help to prevent irritation from the Vitamin C. I personally have slightly sensitive skin that occasionally reacts to harsher ingredients – pretty much any type of acid turns it a bit red, and that’s what I noticed with this mask. Fortunately, it didn’t sting or burn while the mask was left on (even past the recommended 10 minute mark), and the redness disappeared after about 10-15 minutes. A few splashes of water and some gentle massage is all it takes to remove the mask (it doesn’t require a rough scrub with a washcloth to remove like other clay masks I’ve tried). My results after one application of Farmacy Bright On. 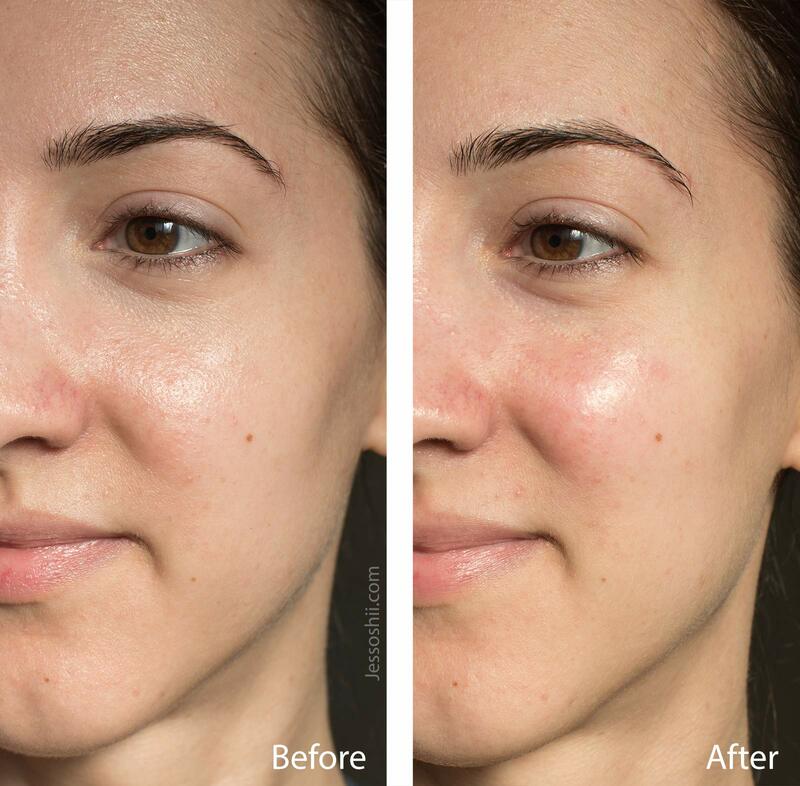 If you look past the slight redness on my cheeks (which eventually subsided), you’ll notice a difference in texture in the after photo – my skin looked and felt so much smoother! It also left my combination skin looking more matte around the nose and forehead (my worst spots!). After just the very first treatment of Farmacy’s Bright On mask, my skin’s texture had noticeably improved. The surface looked and felt so much smoother, and most impressively, my pores were looking a bit clearer and smaller. And following a full week of treatments, my face was looking a whole lot smoother and more even toned, and also extra glowy! I’m very much looking forward to incorporating this gem into my routine as we head into fall and winter, and I highly recommend it to anyone struggling with uneven, rough skin, or have large, congested pores that need a little TLC! Have you tried Farmacy’s Bright On Vitamin C Mask, or any of their other skincare products?